2017 செப்டம்பர் திங்கள், திருநெல்வேலியில் நடைபெற்ற இரண்டு நாள் மலர் மருத்துவ கருத்தரங்கின் உரைப்பதிவு விரைவில் இங்கு கிடைக்கும். The audio recordings and course material would be uploaded soon. Inspired by Dr.Edward Bach. A bacteriologist. Pathologist and homeopathic physician, the book Healing wih Flower Medicine by Dr. K.Poongavanam is a lucid collation of remedies for healing both spiritual and emotional conditions. The author has come out with a detailed Materia Medica Flora that lists out the flower with its botanical name, matchings with the type of person or situation, the method of usage and ultimately, he has drawn a complete sketch of each flower remedy. However, the author has specifically mentioned that the original source books for such remedies must be read like the “The twelve Healers” by Dr. Edward Bach so as to understand and build a wider Materia Medica. Way back in the 1930s, Dr.Bach had opined that the dew found on floral petals retained healing properties of a particular plant. Although often labelled as homeopathic medicines as they are used by diluting in water, strictly speaking, Dr.Bach’s remedies were truly not that as they were not following the basic tenets of Homeopathy. Bach said, “Illnesses were as a result of a conflict between the purposes of the soul and the personality’s actions and outlook. Bach was satisfied with the method he had evolved either by boiling or nurturing in sunlight, because of its simplicity, and because it involved a process of combination of the four elements; the earth to nurture the plant, the air from which it feeds, the sun of fire to enable it to impart its power, and water to collect and be enriched with its beneficent magnetic healing. Bach flower remedies are not dependent on the theory of sucessive dilutions, and are not based on the Law of Similars of Homeopathy. The Bach remedies, unlike are all derived from non-toxic substances, with the idea that a “positive energy” can redirect or neurtalize “negative energy”. “To understand the suffering human mind and to make use of the suitable flower remedy, we need to follow different strateges. Studying mind in its opposite condition helps towards this end,” says Dr.Poongavanam. 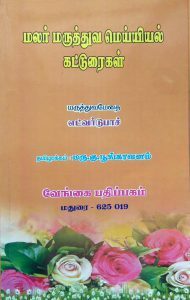 He further says that to make best use of flower remedies, there is a need to adopt some techniques which will help us to understand, remember and recall those symptoms which are given against each of them. For instance, Agrimony, it is brooding, restlessness, grieving silently, etc and for Clamatis, it is dreamy, drowsy, day dreaming, etc. The book has highlighted seven groups as Dr. Bach has placed all his 38 remedies in seven groups. They have been clubbed in accordance with their affinity or otherwise, with one another. That way he made it possible ot comprehend them comparing and differentiating it with one another. The seven groups, with their leading one line symptoms have been classified as: fear, instability, disinterest, loneliness, oversensitive, despondencey and over care for welfare of others. Apart from this, there is a combination of five flower remedies which is considered a saviour in the real sense. The rescue remedy which is the best known flower remedy is the combination of an equal amount each of Rock Rose, Impatiens, Clematis, Star of Bethlehem and Cherry Plum remedies. The product is aimed at treating burns, cuts, confusions, heamorrhages, stress, anxiety, and panic attacks, especially in emergencies. The author concludes that this is remedy which if given at the right time can save life and definitely perform the function of a first aid remedy, in any condition. A useful book, if properly understood and matched with the right person and group, however, do not try out this remedy on your own without expert help. In case you have a problem with that link, you can find a printed copy of that article here. In case you wish to download, here is the download link. இங்கிலாந்தின் மலர் மருந்துகளைப் பற்றிய அறிமுகமாக மலர்ந்துள்ள நூல், மனித மனத்தின் பல்வேறு நிலைகளுக்கேற்ப அளிக்கப்படும் மலர் மருந்துகளைப் பற்றி விரிவாகக் கூறப்பட்டுள்ளது. இனம்புரியாத அச்சம், பிறரை அடக்கியாள நினைக்கும் மனப்பான்மை, ஊசலாடும் குணம், எதிலும் நாட்டமில்லாத மனம், எப்போதும் பேசிக் கொண்டு இருக்கும் பழக்கம. எதற்கெடுத்தாலும் எரிச்சல்படும் போக்கு, பிடிவாதம் போன்ற பல மனநிலைகளுக்குரிய மலர் மருந்துகளைப் பற்றி மிக விளக்கமாகவும் தௌ¤வாகவும் கூறியுள்ள நூல்.